Lately, I’ve found myself lamenting that most of my recent creations, especially the cool-weather appropriate ones, have been solids in neutral colors (black, grey, navy blue). 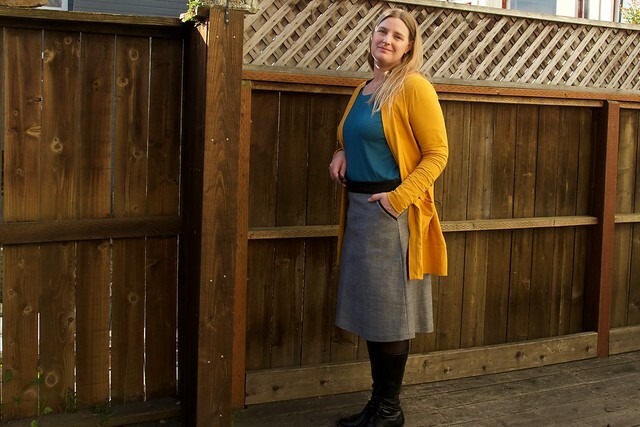 Don’t get me wrong, I love solids, and I love neutrals that can easily fit into the rest of my wardrobe, but it was starting to feel a little bit drab. I need to try to strike a balance between neutrals and colors/prints in my sewing, and this colorful outfit is a good start. 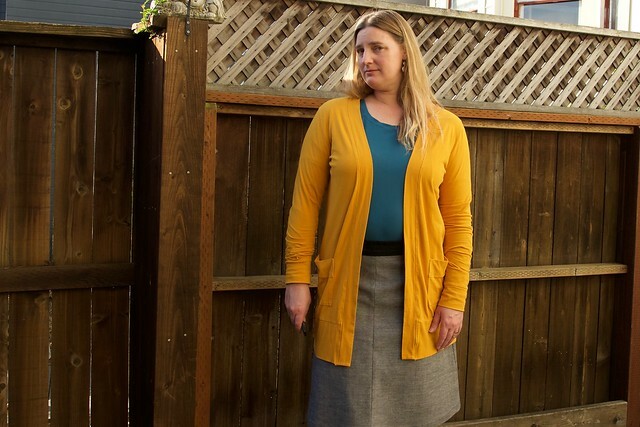 This cardigan pattern has been really popular since it was first released back in February. I was a bit skeptical at first (as I usually am!). I wondered why you would want a cardigan that didn’t close in the front…it seemed like it would defeat the purpose of a cardigan. But this pattern just kept popping up in my instagram feed and blog reader, and every time I saw a new one I thought, ‘ooh…that’s super cute!’. It’s just such a flattering shape, the way it hugs the neckline, skims the body, and maybe most importantly, let’s you show off your top underneath it. Perfect for layering. And extra long sleeves, I love long sleeves. I’ve had this mustard colored stretch jersey sitting around in my stash for quite some time. I had used a tiny bit of it in some baby clothes for a friend, but I couldn’t bring myself to make anything for me with it. The color just seemed like a bit too much my taste. But at some point I draped it over my shoulders and I realized that in smaller doses and when combined with other colors it looked quite nice. It pairs especially well with blue, which is my all-time-favorite color and quite prevalent in my handmade wardrobe. 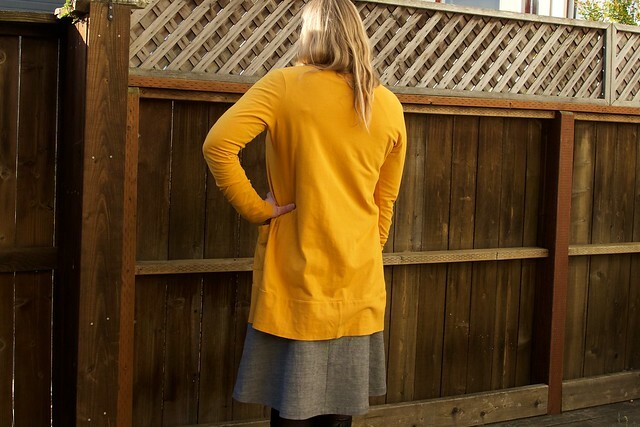 Turns out, mustard jersey is a perfect match for the Blackwood cardigan! In fact, I’m not the first to make a mustard Blackwood. Rae (Made by Rae) made one, and so did Lori (Frivolous at Last), Anya (Anna-Zoe), and _ym.sews_. 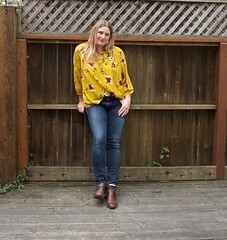 All lovely versions, and great outfit inspiration! 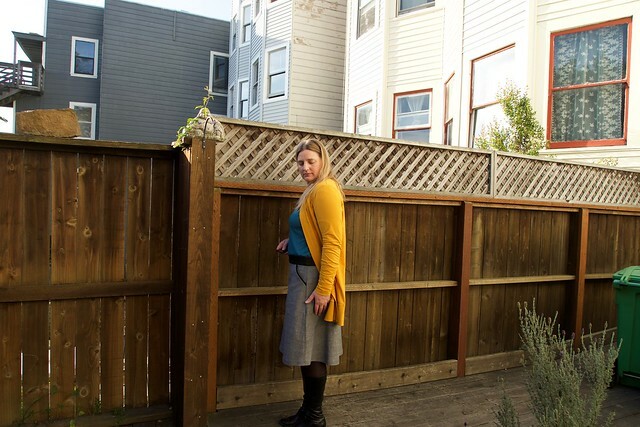 This cardigan was easy to put together – I used my serger to sew it together and my regular sewing machine with a narrow zigzag stitch to topstitch the neckband and the pockets. I had to cut the waistband in two pieces in order to fit it all in the amount of fabric I had. 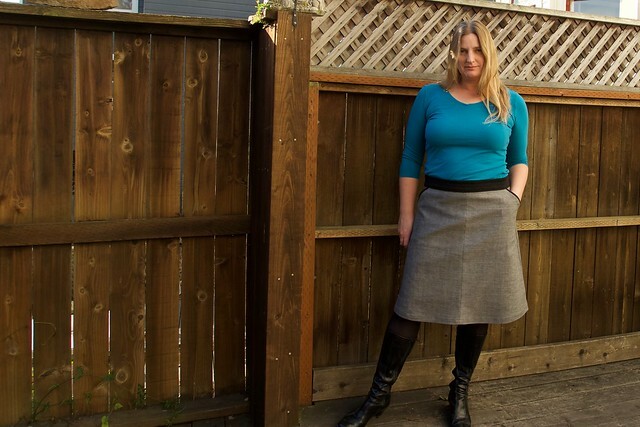 I made the skirt from some stretch black denim – a remnant that I picked up for cheap a couple years ago. This was another fabric that had languished in my stash for a while – I just wasn’t crazy about the black color, but when I flipped it over, I loved the look of the grey reverse side of the denim. I used the right side of the fabric for the waistband and the pocket accent pieces. 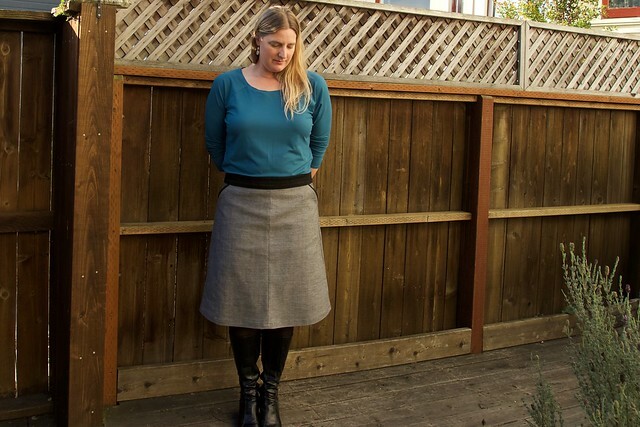 This is a really basic A-line skirt pattern – popular with beginners – and I’ve had it for a while. 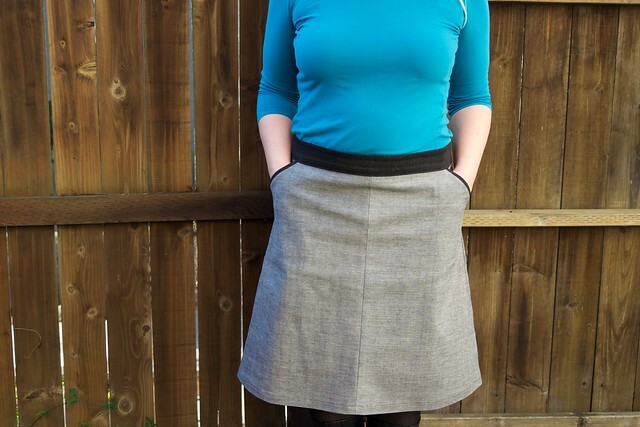 I added the slash pockets with accent pieces to this pattern because a skirt without pockets seems pointless to me. The pocket is lined with a scrap of magenta cotton, which you can see a tiny peek of here. And look at that perfectly inserted invisible zipper! 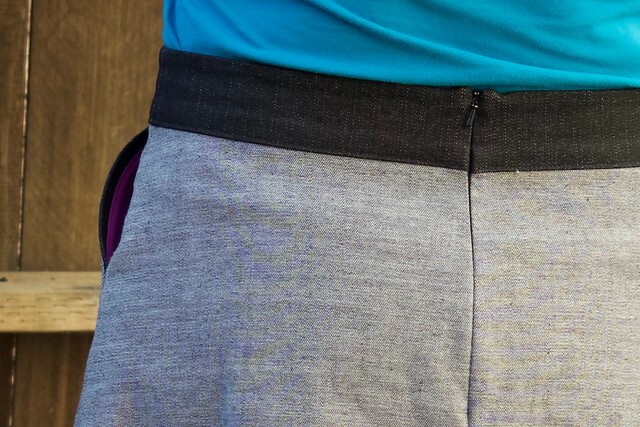 This pattern is designed for non-stretch fabrics, which I really should have thought more about before making the skirt. I ended up taking about 1″ out of the center back and 1/2″ out of the sides. I also slimmed down the sides to make the A-line shape a bit less exaggerated. This fabric has so much body, that it really stands up on its own and looked a little strange with the original shape. I should have sized down one or even two sizes to account for the fabric stretch. Because I basically sewed the whole thing together (except the waistband) before trying it on, I couldn’t take too much out of the sides or front after the fact (the pockets made that especially challenging). Despite that, I like the end result – it’s still a little bit looser than I’d like, but totally wearable. And the contrast waistband and pocket accents really turned out well. 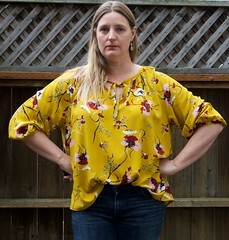 Note: This is only shown in some of the pictures – others show a tighter fitting ready-to-wear tee in a similar color.